This 30 oz. tumbler is the perfect size for me. I love to drink a lot of cold water throughout the day. Makes this perfect for me. I actually have never owned a stainless steel tumbler. I have only bought the pricey hard plastic insulated tumblers from amusement parks or shopping centers over the years. So I didn’t know what to expect. After a couple of hours the plastic, insulated tumblers would start to get warm and the ice cubes were melting fast and almost gone. Well, with Florida’s summer weather usually in the mid 90’s outside it’s been normal for the plastic tumblers to start to heat up. 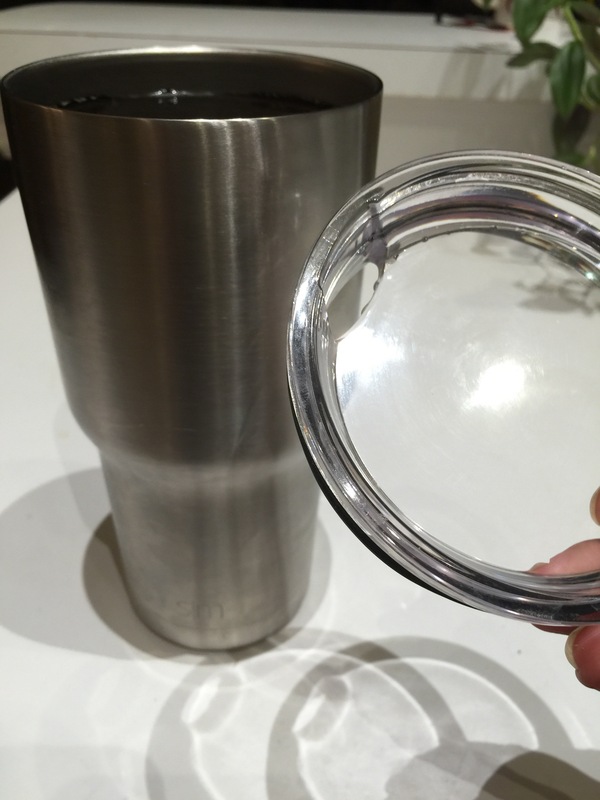 The new stainless steel tumbler is double insulated, very sturdy and well made. It arrived at my home two days after I originally ordered it since I have a Amazon prime membership. It was nicely packaged and placed at my front door outside my home. I quickly opened the package and wanted to find out how well the tumbler actually kept drinks cold. I washed it out, rinsed it in cold water (since I was putting an ice cold liquid in it) and filled it up with really ice cold water from my refridgerator. I went about my day, so from 8 am until about 4 pm was out and about with my tumbler. I was outside in 94+ degree weather. That’s sunny Florida’s usual summer weather. Was sipping my wonderfully still ice cold drink at 12:00 pm and it was still as cold as 8 am. I decided to go shopping, so I refilled the tumbler with very cold water and and three or four icecubes. I was shopping for over two hours and the water was still as cold as 12:00 pm when I first pored it into the tumbler. Again I was still drinking the same water until 8:00 pm. The water was still really cold and the icecubes were starting to melt. I put a couple of icecubes in my tumbler and topped it off with more cold water. I like to keep a drink on my night stand in my bedroom when I retire at night. So I had three or four drinks of water during the night. Water was still very cold. I got up around in the sm and frank some more water and it was still nice and cold. I am very happy with my 30 oz. stainless steel tumbler. I like this product a lot. It work great for me. I don’t need one of those designer tumblers. This product is very good and gets the job done. I stay hydrated with surprisingly cold water all day and night too! Great product! This product was received for free in exchange for my honest and unbiased review . I received the tumbler for free as part of a product test market. I love it! I filled the tumbler with ice Ns water early one morning and we set off to tour the Black Hills. I really like the fact that the tumbler will fit into the cup holder of my vehicle! We were in and out of the vehicle all Day and by the end of the day, about 14 hours, there was still ice in the tumbler and my water was cold! Great product & well worth the money.